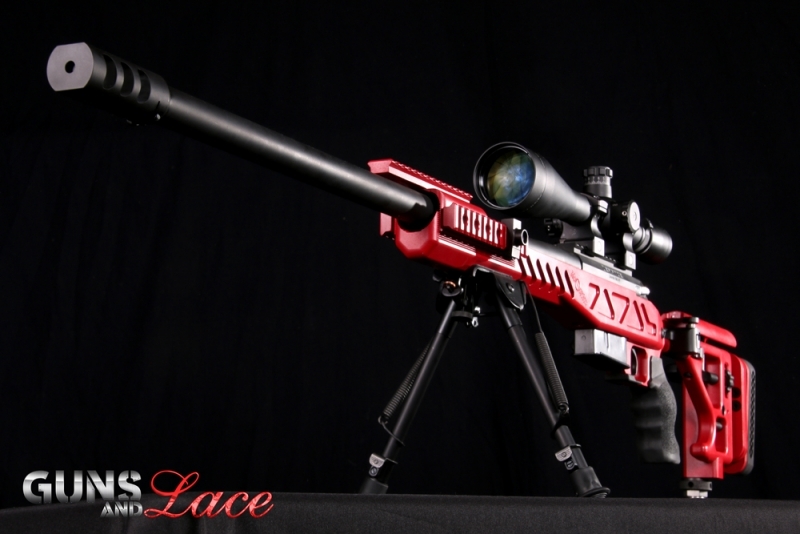 Guns and Lace set out this month to build the ultimate precision rifle specifically with the woman shooter in mind. When it comes to distance rifles the experts will tell you that at the end of the day it is all about accuracy. We could not agree more, so to get started on a custom build worthy of the term "ultimate" we sought out some of the best names in the industry including Anette Wachter, 30 Cal Gal, champion distance shooter and the holder of many USA and European titles. and the guys over at Hardened Arms to consult and assist us. Anette helped us choose the caliber and action. 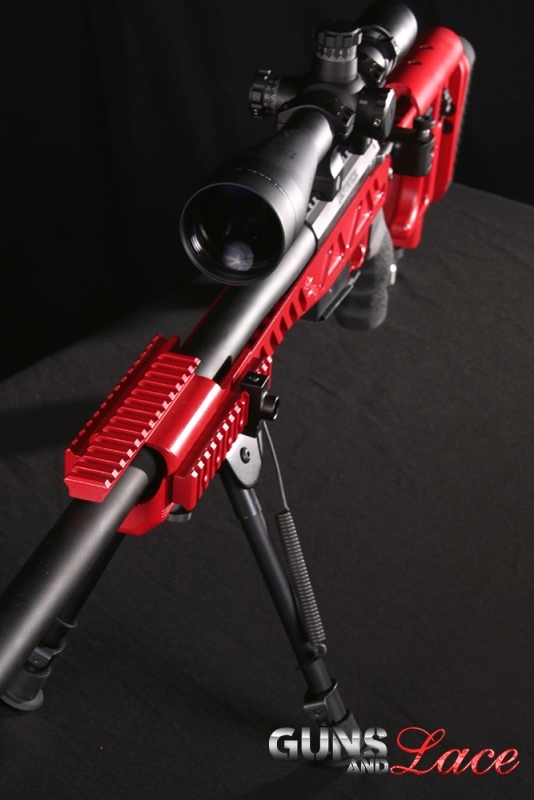 We talked pros and cons and decided together on the 6mm SLR and a custom Defiance Deviant Tactical action. With input from Hardened Arms, we based our build on a high quality foundation to build on and went with a handmade chassis from Craig Kierstead at PDC Custom. A match grade barrel paired with a spiral fluted bolt was put together by the gunsmiths over at Radical Firearms. Triggers are very important when it comes to throwing lead down range long distances and the Timney trigger was a perfect solution. We capped it all off with a PDC Custom muzzle brake. For optics add in a beautiful scope mount from Nightforce and a Leupold scope and we've the finishing touches. Cerakoted in my signature Guns and Lace Red and hand carried home from Houston in a rolling rifle case with a squeaky wheel that had everyone in the airport staring at us as we walked through the terminal. We could not wait to get out and shoot it. We headed out to Rattlesnake Ridge Range in Eastern Washington. Our ammo box filled with custom match ammo hand loaded for us by Hardened Arms. It was a beautiful day, with a stiff breeze blowing across the range. We shot from 600 yards and sighted in the rifle, the wind was a challenge but using our Kestrel wind meter and leaning heavily on Anette's world class distance shooting, we dialed it in. We were able to stay within the 10 ring in spite of a very heavy breeze that rose and fell what seemed like every second. 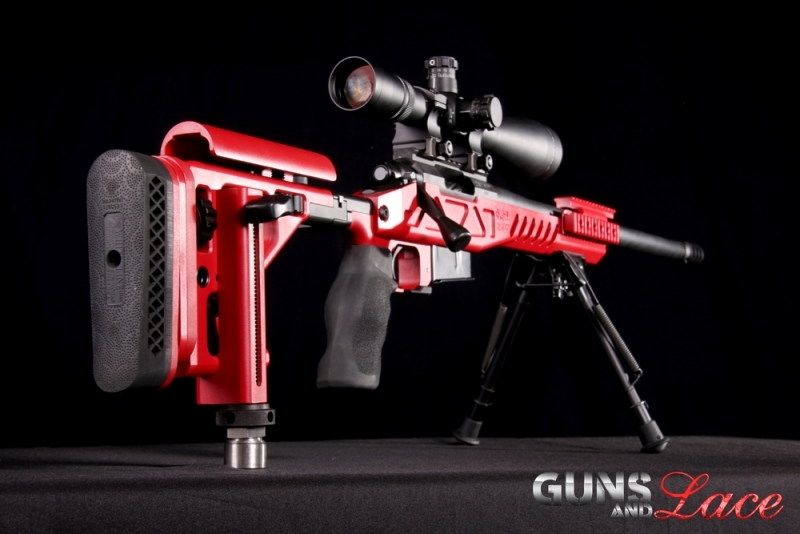 The chassis was incredible, light, rigid and a beautiful foundation for a rifle that had all of us swooning. So often the difference between average and awesome is the trigger and how it breaks. I can't say enough good things about the trigger from Timney, it was such a sweet and clean break that there was just no anticipation to mess up the shot. I loved the action, how smooth the bolt was and the stability of the optic in the mounts. In a world where even the beat of your pulse can make a big deviation in the path of a bullet, having your scope be rock solid on the the chassis is critical. Favorite Quote: "I would rather be hated for who I am than loved for who I am not." I recently asked our Guns and Lace male fans to describe the characteristics of the ideal wife and the list went like this: beautiful, full of energy, great smile, loves to shoot, enjoys the outdoors and is a great cook because of course the way to every man's heart is good food. You might as well have been describing this month's Guns and Lace girl, Andi Nicole, because she is all that and more! i agree,The Shack is a good book i ordered one then seen i had one in my collection, oh well i have two. better than none. i also like the book ,pilgrims progress.